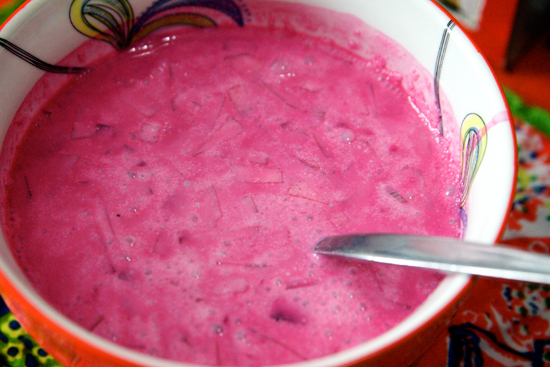 Although I can’t verify its authenticity as a legitimate borscht, I can tell you that it is an amazingly delicious cold soup. Boil scrubbed beets in salted water for 30-40 minutes, set them aside to cool. Take 2 cups of the water and 2 cups of chicken broth. Add 16 oz. of sour cream (yes, the whole container), a heaping tablespoon of plain yogurt, two diced and de-seeded cucumbers, a quarter cup of sugar, champagne vinegar and lemon juice to taste, salt and pepper. You can de-skin the beets with your hands once they cool, but be careful what you wear. Cube and add the beets to the mixture, stir and chill for 4 hours. Beautiful color! It’s good for summer.I’d like to make it sometime.